Upon request of my customer I have included additional layout for a longer top and it was already tested: black top. RR also allowed to include photo of her finished top into the description. ► photo-tutorial for working such round motifs without cutting off the yarn and making the loop of square motifs in each sleeve without hiding lots of ends. This crochet pattern is given for bust circumference 91 cm/36”. I have included suggestions on how big should be your gauge if you wish to crochet this crop top for bust circumference 84-89 cm/33’’-35” and 96-101 cm/38-40’’. In this case you will need to use another yarn and/or hook (for example, for bust 101 cm/40’’ the width of each round motif will be just 1 cm (0.4”) larger than in the original top shown in photos). 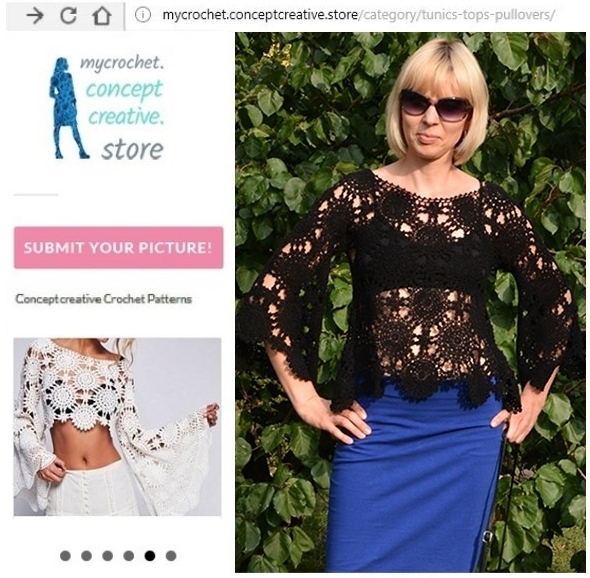 Feel free to share photos of your completed project on mycrochet.conceptcreative.store or Ravelry in exchange for one of these two patterns (please send me the details of your transaction and choose poncho or dress pattern). 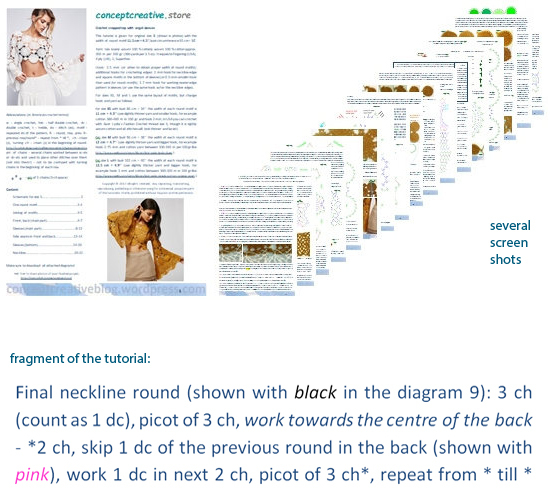 Not shown in this preview are 3 additional files revealing all connections between motifs in sleeves, front and back – these are separate scaleable layouts for magnifying all stitches in your computer or tablet and allowing to crochet beautiful top shown in the cover photos. 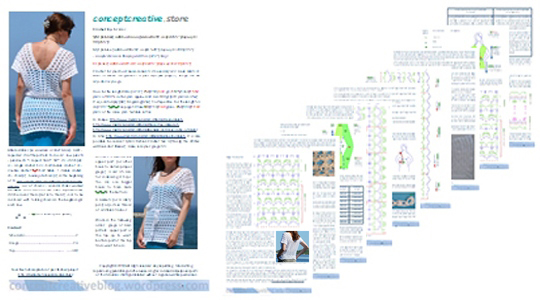 Not shown in this preview is 5th PDF – additional written and charted tutorial with 64 photos illustrating my NO-YARN-BREAKING concept for all round and square motifs in this garment. This beautiful crochet cover up is perfect for hot summer days in the city or warm-weather vacations. The cotton yarn and flattering V-neck make this design endlessly breathable. The length can be adjusted as you – yarn usage in the pattern is stated for a shorter top and a longer beach dress (shown below). XL with bust circumference 110-114 cm (43-44.5’’).